﻿ Florentino Pérez: "I wouldn't sell Cristiano Ronaldo, not even for 1000 million euros"
30.05.2013 » Florentino: "I wouldn't sell Ronaldo, not even for 1000 million euros"
With José Mourinho moving out of Madrid, Cristiano Ronaldo's future at the club immediately started being the target of a lot of speculation. Despite Ronaldo's name being constantly linked with a transfer to several top clubs in Europe, Florentino Pérez recently reaffirmed that Real Madrid is fully committed to convince their biggest star to renew his contract and stay in Spain. 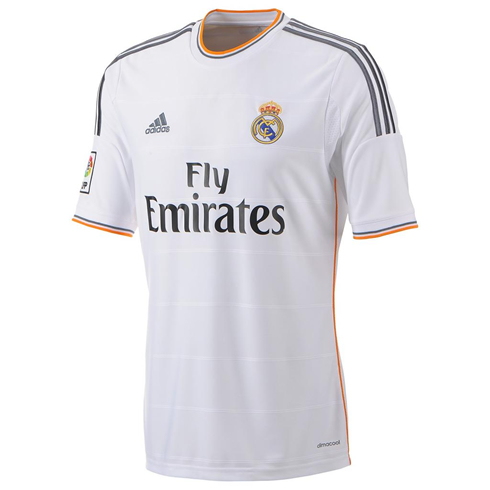 Before getting started, you can take a sneak peek at the new Real Madrid jersey for 2013-2014, with the all new Fly Emirates sponsor on it front. The leaked picture is above. The Real Madrid 2013-2014 shirt/jersey announcement is expected to take place in the upcoming hours, but we're happy to present to our visitors in first-hand. When Cristiano Ronaldo signed his first contract with Real Madrid back in 2009, he has benefited from the "Beckham law", that basically allowed him to pay a flat tax rate of 24% over his salary/income from Real Madrid, instead of the supposed 43% that high-waged people are demanded to pay in Spain. However, since January 2010, the "Beckham law" was cancelled and therefore it ceased to be valid for new contracts signed from that point onwards. That basically means that Real Madrid would have to significantly increase Cristiano Ronaldo salary, just to allow the Portuguese star to keep receiving the same net salary he gets these days. Nevertheless and despite all these facts, Florentino Pérez is confident about overcoming all the difficulties and persuade Cristiano Ronaldo to extend his current contract with Real Madrid. Florentino Pérez: "I'm willing to do everything in my power so that Cristiano Ronaldo may renew his contract with Real Madrid. He still has two years left, but he surely is the best football player in the World and we would like to keep him with us, as well as allowing him to become even more of a leader and a flagship of Real Madrid", started by pointing out the Spanish business man. Despite the existence of many clubs reportedly interested in buying Cristiano Ronaldo, the Real Madrid president assures that the Merengues' intention has never been to sell their most valuable asset. Florentino Pérez: "I wouldn't sell Cristiano Ronaldo not even for 1000 million euros. We are not a "selling club". I would like for him to stay in Madrid until the end of his football career. That would be just perfect...", confessed the 66-years civil engineer. Florentino Pérez: "Ronaldo is a winner and what he wants is to win titles and as many FIFA Balon d'Ors as possible. Real Madrid is precisely the right club for him to achieve that! When he said he was sad a while ago, I talked with him and let him know that I would be doing everything I could to make him happy again. 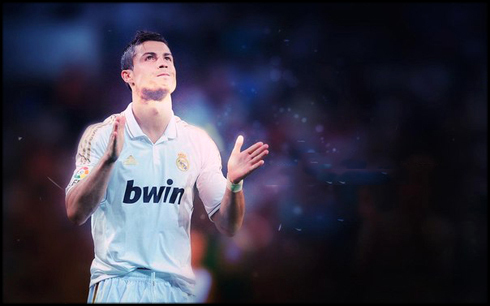 We want him to be glad all the time and we want him around with us", affirmed the Real Madrid CF president. Florentino Pérez: "We have a tradition of signing up the best football players in the World, simply because that the business model we have implemented in Real Madrid. We have a spectacular team and the truth is that we can't have many great players, at least not all at once. But if there's the possibility to bring another truly world-class player, we'll go after him. All I can tell for now is that Gareth Bale was born to play in Real Madrid", remarked the Merengues president, somehow confirming that the Tottenham's Welsh superstar will certainly be one, if not the main target for the upcoming transfer season. 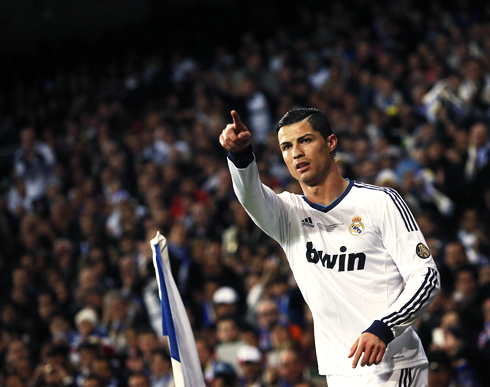 Cristiano Ronaldo last game for Real Madrid this season will be against Osasuna for the Spanish League, on June 1, 2013. You can watch Juventus live stream, Real Madrid vs Osasuna, Barcelona vs Malaga, Bayern Munich vs Stuttgart and USA vs Germany, all matches provided from our football streaming section.